Pierre-Alexandre devoted his life to his passions. This allowed him to realize his most daring dreams and face huge challenges despite many obstacles. He also had one of the longest careers in the history of male mogul skiing with 15 years of performance at the World Cup. Thanks to a strong internal force, he was able to recover from a major cervical fracture that could have paralyzed him or cost him his life. This happened only a month before the 2002 Olympic Games, to which he could not participate in. He had to relearn to walk, run and ski. Becoming a leader of the World Cup circuit one year after the accident is one of the most important achievements of his skiing career. Three times, he was unable to make the Olympic selections, which is usually a formality for a skier who has spent almost all his career in the top 5 World Cup circuit. In 2007, he was a world champion and kept pushing until 2010 to represent his country at the Vancouver 2010 Olympic Games. He gave the best performance of his entire career in front of his family and finished 5th. Pierre-Alexandre is best known for his teaching skills in skiing than for his performances. For 15 years, he taught skiing in various commercial camps in Whistler and he showed more than 1,800 skiers of all levels how to improve their skills to a higher level. The development of his teaching techniques became a priority. At the beginning of his career, he was trained on different coaching techniques by the best coaches and world leaders, Steve Desovich and Cooper Shell. These excellent coaches also taught Olympian gold medalists Jean-Luc Brassard (Lillehammer 1994) and Johnny Mosley (Nagano 1998). 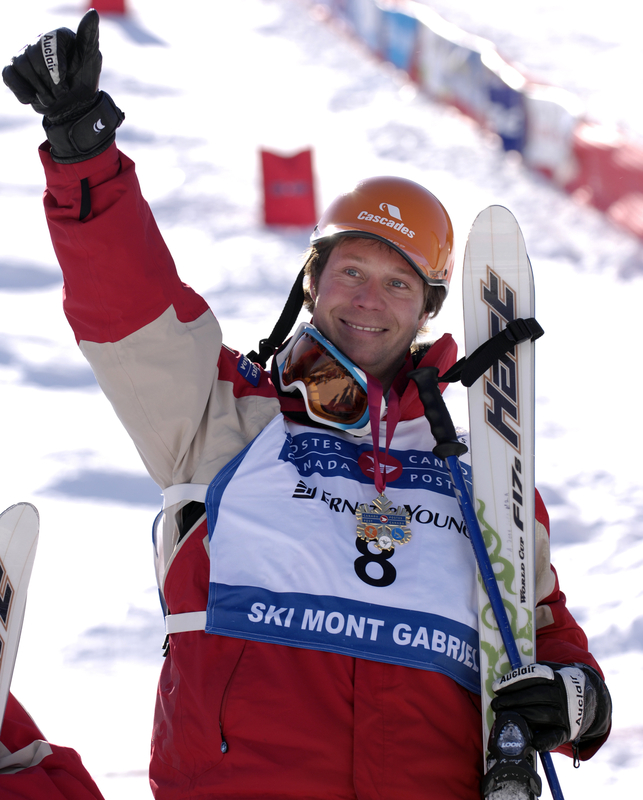 Over the years, Pierre-Alexandre has taught several skiers who have become Olympic champions and world champions. His reputation as a coach is well-known: some of his former students who are now in the World Cup ask him for his valuable advice while he is still an athlete. His greatest pride is that he was able to teach Mikael Kingsbury, with whom he developed a friendly relationship of mentoring and confidence. When his career in the World Cup ended, his passion for parachuting took over. He gradually worked his way to the top of skydiving. He now shares his knowledge at Voltige parachuting school as a P.A.C. instructor, tandem and cameraman. He has great ambitions! His new project: ski flying. This means landing without a parachute, of course under the supervision of the great Luke Aikins (stuntman, expert pilot, paratrooper, etc.). Aikins participated in a number of events, including the Redbull Airforce and the Heaven Sent (landing in a net at 25,000 feet). Recently, Pierre-Alexandre supervised, guided and assured the safety of the Jumpoff event as part of the Jackalope at the Olympic Stadium while 10 participants went BASE jumping from the top. A first in Canada! During the Sochi Olympic Games in 2014, he was a commentator at the Redbull Stratos event on the French channel TVA Sports. He is also a commentator for the Freestyle World Cup in Val St-Côme. In 2014, the Mont-Sainte-Anne ski resort in Beaupré, Quebec, underlined his career and perseverance by opening a brand-new trail in his name, La P.A. Rousseau. The Jean-Raimbault high school in Drummondville also proudly named a gymnasium after him. He has given a multitude of corporate and school lectures to motivate people and share his knowledge. He is also one of the only speakers to develop varied and personalized subjects to meet the needs of clients. Redefining your goals when you have already achieved your objectives in order to continue to grow and advance. Performing under pressure: how to stand out when the pressure increases? Online advice MKT multiplatform Evergreen campaign as a graduate of Expert Academy in California by Brendon Bouchard. Stress: how to use it to your advantage. The importance of never letting anything fall between you and your goals. Teaching the increase in memory by including different senses. Have a balance of life and get to know yourself. Learn to change your content or approach with your clients. Explanation of the basic phenomena of interpersonal communication inspired by Guillaume Dulude Ph.D.
How to create a relationship of trust? Explanation of human biology in interpersonal communication. Developing your ability to connect with future clients during networking activities. The art of never giving up on your dreams and goals. Pierre-Alexandre skydived with a 101 year-old lady!